Portugal is one hour 'behind' our time, so the state banquet has probably not started yet. Oh didn't know that! That explains a lot, since most banquets start at 8 o'clock. According to the website of the Portuguese president the state dinner should start at 20:00. Which would be now. BTW: it has been confirmed that the duke and duchess of Braganca have also been invited by the Dutch court to the concert tomorrow evening. I believe we have seen the dress during the interview for the 50th birthday of the king. He showed a photograph of the family and added that it was taken during a wedding in London. Let's hope the Duchess of Braganca will wear a tiara too. Both the king and queen seem to be wearing the order do Infante Dom Henrique. Did the Duke and Duchess of Braganza attend tonight? A Collar of an Order is to be worn around the neck at not on the Shoulders with the Sash. Queen Sofia of Spain wore often both but on the right way. I don't believe there are any such hard abd fast rules. 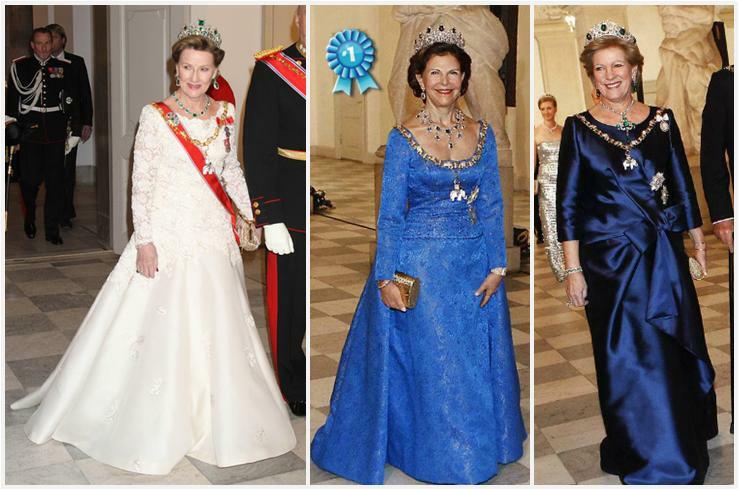 Queen Silvia has worn collars not unlike Maxima in the past. Doesn't it have to do with sashes and collars not touching the skin of the wearer? exactly. I can't think of a lady who has worn the collar on her bare skin. It's likely uncomfortable and not good looking. I would have liked it if she had tucked her sash in and pulled up the one side of the collar, but I'm nitpicking. Have seen a pic on Twitter oft the Duchess there. Sie was wearing the big diamond Tiara Form Queen Amelie. Later during the King's Speech , Sash and Collar were on the right place. The pictures show that the way Máxima wore her collar is not different from another Queens. No one of them wears it around the neck. It seems that the duchess was wearing two tiaras: the dog collar necklace is versatile and can be worn as a tiara too. The necklace belonged to Queen Amelie, she left it to her godson, Dom Duarte Pio. According to Vorsten, the president of Portugal joined the king and queen this afternoon at an exposition of paintings of the Rijsmuseum and some from the royal collection. The attendance was a spontaneous gesture of the president, as he was not scheduled to join in. Two paintings of the royal collections showed the sisters Sabina Delphica and Mauritia Eleonora of Portugal, daughters of Emilia of Orange-Nassau (daughter of William the Silent and Anna of Saxony) and 'Prince' Manuel of Portugal. He was the son of Antonio, prior of Crato, who ruled as Antonio I of Portugal for 33 days only. Antonio was the last dynast of the house of Avis. The wedding was against the wishes of Emilia's brother, stadholder Maurits. After Maurits discovered the secret marriage, he put his sister first under house arrest. When she refused to divorce Manuel, he banished her for 10 years. The Presidency of the Portuguese Republic website has photos and a video from the state banquet on Day 1. Photos and a video of events earlier in the day. Duke , the Queens wore appropriate Evening Dresses for wearing Collar and Sashes.. You show a picture of the King's Speech when it stands correct. For the officlal Pictures she was 100 % wrong. 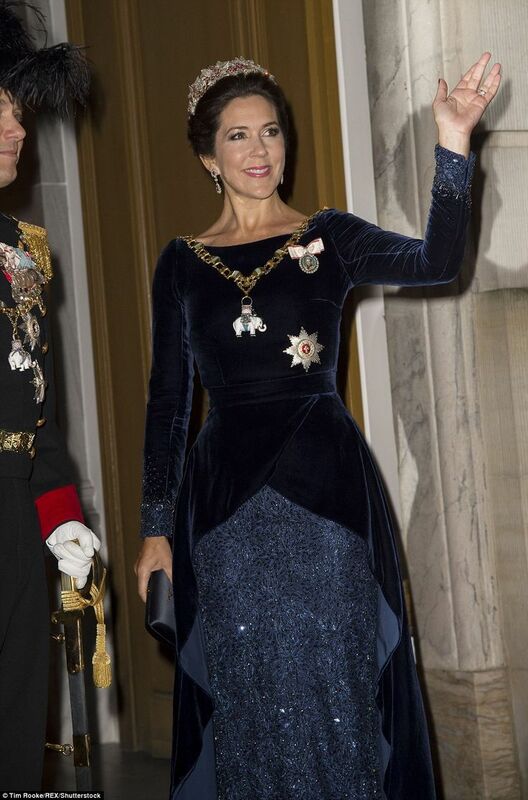 Everybody may wear jewels but a Collar and a Sash is the greatest honor from Portugal to the Queen of the Netherlands. The king and queen spoke to the Dutch press today. Apparently Portugal gave 400 bottles of Port wine to Princess Beatrix and Prince Claus, for the birth of Prince Willem-Alexander. During her state visit in 1990, queen Beatrix said that they had not finished the bottles yet. And even today the stock has not been used. The king did add that he had the bottles checked and re-corked. The press also enquired about the death of Jorge Zorreguieta. The Queen said that it had been a sad summer but that she is somebody who looks forward. Her work gives her a lot of energy. When asked what they would tell about Portugal to the three princesses, the king said that they would first be there to hear stories from them. The two eldest have a week with lots of school tests. Afterwards they would of course tell about their visit. They also inquired why Palace Huis ten Bosch will not receive solar panels, as the idea was to make the palace CO2-neutral. The king said that there were special regulations for historic buildings, so the panels were not allowed.